Shuffling around without any real purpose, the wolf spider had been wandering around the manor restlessly. Her mind was filled with riddles pertaining to humanity. Its weapons, the clothes, its manners. There was a lot that made no sense to her, troubling her as it contradicted both her nature and the need to abide by Sero's desire to get to know humanity. She had come to the realisation that on her own, she was unable to learn all about it. And though the servants of the house were rich in knowledge, they were spiders first and foremost - no real humans - and thus not the 'real thing' for her to observe. Even though they could mimic just fine, they were just that - mimics. No, the wolf spider needed a real human to observe and experiment on. An original from which she could copy. There had recently been an influx of humans seeking out Sero's attention, but Haka had yet to really pay them much attention as she had mostly been trying to figure out the puzzle that was fuinjutsu. The mystical symbols were keys to something greater, requiring an inkling of chakra to reveal their power. She had been able to replicate its effects for her own, but was now left with wanting more. This need was enhanced even more when she had been exploring Sero's armoury and saw how a windmill shuriken had randomly left and reappeared with blood on it, its vanishing trick remaining an unresolved mystery even now. Eventually, the wolf spider decided she would have to find Sero again so as to ask him for more. During her aimless wandering, she had not spotted him as of yet and decided therefore to make her way towards the highest floor, hoping to catch him in his private quarters. Instead of finding Sero, a variety of unfamiliar muffled sounds was heard behind the door leading to his throne room. Haka halted for a moment, holding completely still as she listened that what transpired. Then, as if on cue, she opened the door without knocking, seeing a half-spider half-human being rather pallid in countenance. There was no trace to be found from Sero, though she had a vague impression her Creator had just been here very recently. The sharp scent of vomit and the taste of terror lingered in the area, and as Nova was the only being in the whole room currently present, Haka's stoic gaze fixated itself apathetically on the spider-human-person, her amber eyes a glint of warmth in comparison to her general cold and distant attitude. Not for a single moment did it cross her mind to clean up Sero's room or ask Nova what she was doing here by herself, nor did she wonder if she was well or needed help. The spider-in-diguise knew not such empathy, for survival during her growth as an Unmei had not taught her such. Considering the spider-human-being in front of her did not bleed nor edged the verge of death, Haka was fairly certain she would be just fine. Fine enough to reply to her question. "Where is Sero? ", she asked with a soft, almost hushed voice that reflected the forlorn feeling of Kirigakure's quiet mists. A sharp contrast to the ever-present dreaded aura she carried wherever she went, yet all together her voice emphasised the hiding presence of death - her name did mean, 'grave', after all. Once her question was asked, Haka patiently waited for her to reply, amber eyes not leaving Nova's for a single moment. "You have now experienced what it means to reside here. Often all manner of beings come here seeking my life or a way to wound me by those around me. It is a mistake on their part. Few ever return once the effort has been made. Fewer still are left within the land of Kiri still to tell the tale. You may choose a room on the second floor and rest there. There will be a training exercise in the next few days for all the students of the manor. I suggest you get to know them in the mean time. As for all this, if you should take only one thing from this, he crossed me. The fate he has now is what happens should anyone do the same to them as well." Sero spoke to her, his voice heavy with wisdom and not so veiled warnings. 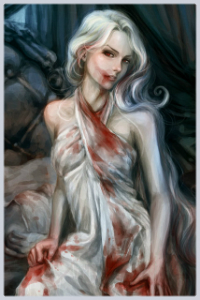 Nova would nod her head and lean forward in a bow, by the time she straightened up the throne was again empty. A distant scream echoed through the chamber and Nova turned her head to the corpse to a sight that she could hardly believe. Though she had never seen anything such a ghost before, she could describe what she saw as nothing other than that. Grey transparent arms reached up from the stone floors and wrapped around the bloodied corpse, dragging it down into the stone. Nova shook her head and blinked rapidly, convinced her mind was playing tricks on her and that she was far too exhausted. Still before her the arms dragged the body down into the stone, blood remaining and staining the ground like a pool of oil. Around the room was evidence of her fight, marks from Kurogokegamu's legs, the remains of her nets, blood from her opponent, yet no corpse remain. Her eyes still blinking in disbelieve she walked around the pool of her own vomit and shakily scrambled up the puppets side and slid heavily into the seat. Gathering what chakra she could manage, the puppet sprung to life and Nova wearily steered it to the door from which she entered. Nova was only meters away from the door when it swung open slowly. Standing in the center of the doorway was a young girl, features reminiscent of the Lord Osada that Nova had just spoken to. Swinging her head to the throne and back to the door, Nova blinked confusedly. "Where is Sero?" The girl spoke, her face as devoid of emotion and Lord Osada's was. Nova just stared at the girl unsure if it was the mansion playing tricks on her or exhaustion making her imagination act up. As Nova's eyes met the girls, the hair on the back of her neck rose on end and her stomach sank with a feeling of fear. There was no obvious reason for the fear Nova felt, as the girl did not appear to be a threat. Still the fear remained, reminiscent of what she felt when she saw Sero for the first time. With one hand she reached down to the wineskin near her feet and lifted it to her lips, if she was going to have a night filled with imaginary monsters she might as well try to enjoy it. She gulped down several large mouth fulls of the wine, leaving a warm feeling in her empty stomach and an almost immediate buzz to her head. Nova The silence seemed to swallow them up for a moment, before breaking with Nova's hoarse voice. “I don't know a Sero... Lord Osada is in here though. Was in here. I think. I mean, he was here..”. Nova's voice trailed off as she spoke, looking around the room as though something might jump out at her. Though Nova's gaze roamed, the girl's did not leave Nova's face. Turning back to the girl, Nova inquired, “might you know what rooms are available on the second floor? Lord Osada told me to find one and rest there”. Kurogokegamu would step towards the door slowly, hoping that this figment of her imagination might lead her in the correct direction of a hot bath and warm bed. Keeping her eyes on the stranger, Nova suddenly seemed to lose some colour in her face, eyes filling briefly with fear before she reached down to grab a waterskin and have a drink. Almost as rapidly as her colour had disappeared from her countenance, it now returned to give her a reddish hue around the cheeks, pushing the fear of something unknown away to make place for a more distant gaze. Time ticked away as the girl in front of Haka sunk a moment into her own little world. To Haka, the quietude had been there this entire time, the stagnancy of the environment only disturbed by Nova's movements and, eventually, her hoarse voice. After having spoken, she lapsed once more in a world of personal fears, looking around her as if the shadows themselves would stir to reach out. They did not do so, leaving Haka to remain staring at the girl before her, blinking only when her human body required to do so. A strange event, found Haka, as it truly seemed as if the spider-girl was reliving a world the wolf spider could not understand. A world where Sero was a different person from Lord Osada, at that. The spider-nin did not bother to explain her that Sero was the same person as her Lord Osada, not quite understanding why she didn't know this, or why she felt the need to call her Creator 'Lord' Osada. Was adding titles to a name a humane thing to do? Still, the spider was not completely lost at its behaviour. She could at least understand Nova's confusion about his presence. When Haka and him had met, he had suddenly disappeared with a few last words as well, leaving nothing more but a few strands of mist behind. It wasn't exactly something she worried about, but that seemed to be different for the girl in front of her. Remaining quiet all this time, eyes still not having left Nova, the girl spoke again, “Might you know what rooms are available on the second floor? Lord Osada told me to find one and rest there”. Did she know? Yes, she did. She had roamed in the mansion for a while. She knew about the second floor and the rooms labelled as 'bedrooms' by the servants walking around. The second floor was divided into two sections, one for each gender. Each contained a few bedrooms and a bathroom at the end. One of the servants had told her these were furnished with the bare necessities to accommodate a guest, but to Haka the desk and soft bed had looked more like obstacles. She knew humans slept in those, but she dit not understand why when one such as herself could just hide in the darkness or hang down a thread to have some rest. Still, the human in the puppet had posed a question, and it was nothing if humane to reply. After a short nod to confirm she knew about the rooms, she spoke again, "Follow me." Seeing as the spider-constructed girl was already approaching, Haka turned around and walked down the stairs, running a hand through her hair. Individualist by nature, she didn't think about looking back to see if the stranger was following her, and walked without pause from the throne room direction the woman's section of the second floor. Not quite a guide, she didn't explain why exactly she didn't take the other side, but she did stop at the first empty room available and opened it, pushing the door open and wide enough for the guest behind her to see properly inside. "Bedroom", she stated, pointing out the obvious as if Nova would not know what a bedroom looked like. It was fairly small, but cleaned. It only sported a bed with a cushion and clean, sober bed sheets, and a simple writing desk with a fitting chair. A build in closet allowed someone to place a few clothes and goods in it but remained cleverly hidden from sight, emphasising the room's spartan nature. Haka would have left the girl then and there as she was still looking for Sero, but the mechanics of the puppet that had been walking behind her captivated her. It looked like a spider, but why was there a human in it? Why was the human not being eaten by the mechanic spider? Why was the spider mechanic anyway? And what were the odd strings that attached the both of them together? Much like how Sero's armoury had triggered an avalanche of questions, so too did the spider-puppet do the same. She already knew that the questions would haunt her if she didn't figure out the puzzles they were, much like one question still drifted in her mind as well: what was the colour of human blood? "You're no spider. ", she declared out of the blue, no matter what Nova was doing. It was as much a statement of her perceptions as an expectation to have said statement explained. OOC: bolded text are links. Also, I assumed the chakra puppeting strings are visible for that last paragraph. In response to the Nova's question the girl nodded curtly and spoke a short response, "Follow me." Silently the girl turned and left the room, not a second glance at Nova after looking away. The young guide moved quietly and made no attempt to move at a speed adjusted for a weary follower, but Kurogokegamu was able to keep pace with her. The metal legs clinked against the stone floor as as they reached the stairway Nova had to try to tread carefully, not wanting to mar the wooden steps. Giggling from the drink she had, even the puppet spiders legs seemed slightly wobbly as she ascended the stairs behind the amber eyed girl who seemed to pay Nova little attention. Reaching the second floor, Nova noticed the each side were mirrored with the same amount of door on each side. Stopping at the first open door, the girl pushed in inward and stood at the entrance, speaking a single word,"bedroom'. The doorway was just wide enough for Kurogokegamu to walk through, and as she walked into the bare room Nova had the puppet settle to the floor in the corner besides what appeared to be a closet. As Nova prepared herself to get out of the puppet, she looked up the girls wide eyes still looking her, or more accurately Kurogokegamu, up and down. The first emotion she had seen from this girl was the interest she expressed in the puppet, and as she noticed Nova looking back at her she spoke again, “You're no spider.” Her voice was flat and she spoke her observation as fact, not a question. Nova was caught off guard at the statement, for a moment and laughed lightheartedly, “Well of course im not a spider silly, I'm just a human like you. Kurogokegamu here is a spider through.” Still smiling about the bizarre statement, Nova clumsily pushed herself out of the puppet and slid to the floor. After stumbling slightly as her feet hit the ground, she turned and straightened up to reach inside the puppets compartments. She pulled out a bundle of clothes and a fairly heavy looking basket that smelled of savory smoked and preserved meats, and walked over to the desk and set them there. Returning to the puppet she pulled out the wine skin again and set it on the bed before flopping down on it. Though it was bare, her exhaustion made it the most comfortable place she had ever laid. As she lay back against the cushion she looked to the door and saw the girl still staring at her. Nova still felt that unsettling feeling in the pit of her stomach and wondered whether it was something she would have to deal with her entire time spent in the mansion. The girls look would have been nerve wracking had she been any more dangerous looking, but as it was the peculiar girl only drew a bit of a uneasy laughter from Nova. As long as she was awake she might as well entertain her drink and exhaustion-addled brain and whatever delusions it would create. Pushing herself back up Nova felt her muscles aching and felt the need the wash the smell of combat and vomit from herself, “would you mind leading me to the bath if there is one I might use?”. From the bundle of clothes that she had set upon the desk, she pulled a soft grey towel and draped it over her arm and hoped the girl would lead her in the right direction. In her other hand she grabbed the wineskin to take with her. Her dark green kimono with spiders on the sleeves had slid off her shoulders and rested around her elbows, and she smoothed out the tank top that she wore over leggings. As she awaited a response she leaned down and adjusted the straps of her wooden leg, a habit that she often did without even realizing it. Straightening back up, she tapped the toes of the wooden leg against the ground ensuring it was in place for whatever walking she would have to do to reach the baths. A human? Haka's eyes didn't leave Nova when she made that statement, finding her an odd human since she was missing a limb. Unlike spiders, who could miss a limb and still be fine with seven others, the impact of a missing limb seemed far bigger on her. Did she need a spider to move around? What an odd thought. She was not sure she liked the idea of having spiders serve humans as mounts, but... this puppet spider seemed meek despite its sturdiness and certainly didn't ooze any sense of superiority. In fact, it was debatable that the puppet spider would pose any threat at all even against its own sort. Wishing to try out her theories, Haka looked at the puppet spider, took out her kunai and was about to poke it against Kurogokegamu when Nova spoke again. Halting in the middle of her action, Haka turned her head again to watch Nova. She sat back up and moved to take out clothes and a grey towel. As she draped them over her shoulder, Haka hid her kunai again, spotting the kimono with spiders only a moment later before the girl in front of her adjusted her tank top and checked upon her wooden peg leg. Finding it odd, Haka lightly tilted her head as she wondered why this human girl held so many spiders near her. Still, as she appeared ready, Haka would move out the room and lead her to the baths at the end of the hallway, once more paying no attention to her guest until she asked her a question. Haka was of a habit humans abhorred spiders. The countless tales of how many spiders died at the hands of humans stood in contradiction to what Nova seemed to do. Although... It was possible she was doing even worse to spiders than most humans. Not just kill them, but dominate them, much like she did with her natural enemy, the waters. Even so, apathetic as she was, it was not as if she'd kill Nova in vengeance. If other spiders proved too weak to survive, they were better off dead anyway. They were no Unmei, as the Unmei, an evolved species of spiders, would eventually dominate the humans (or so she liked to believe). Not the way around. No, Haka would simply register the girl's answer and keep it as her own, though it would influence the way Haka regarded Nova for certain. Eventually reaching the end of the hallway, Haka would push open the door once again, leaving room for Nova to step inside the Romanesque bath which was concealed behind the door. It had already been filled with fresh water after the previous person had bathed. A nipping chill hung in the air, mostly caused by the frisk water. Haka knew that the servants usually made sure the baths were warmed somehow, but as a bath had not been requested and Haka was not exactly a servant, she didn't quite register the need to figure out how to heat it up. What she did register, however, was that she disliked the cold even though it didn't have as strong an effect on her as when she would be in her spider form - cold often causing hibernation among arachnids. "Baths", she pointed out once more at the obvious appearance of the room. After all, it was possible this human did not know the different rooms Sero's manor had to offer, and as such it was a dull necessity to make this well known. Upon Nova's inquiry of the baths the girl before her would turn and leave the room as she did before, silently and giving no direct indication that Nova ought to follow her. She turned down the hall and Nova limped after her, body stiff from being inside the puppet for so long. Walking down the hall in silence, the girl spoke without turning to look at Nova, "Do you like spiders?". Nova smiled and giggled at the question, not quite sure how to answer, “I would say I do. I made Kurogokegamu to look like one after seeing a small spider crawl up my windowsill in my old workshop. I was always so sad I couldn't climb up walls and move fast with the other children my age, but Kurogokegamu lets me go anywhere. I think spiders are just such... marvelous creatures. Between that and the beautiful webs they can make... So my answer is yes. I do like spiders”. The girl gave no indication that she heard what Nova said, and continued to the end of the halls and opened the door, speaking a single word yet again, "Baths". The pair stepped inside, the girl staying by the door. There was a chill in the air, and even before touching it Nova was aware that this would be a cold bath instead of the steaming hot one she hoped for. Shrugging away the slight disappointment she would made due with what she had, the cold water might wash the aches from her joints anyways. Walking towards the raised bath, Nova sat on the edge. Sliding the kimono off her shoulders, she tossed it to the ground beside her. Leaning over she undid the several straps that held her wooden leg in place and slid it off, revealing a stump that ended just above where her knee would have been. Flinging the rest of her clothing to the pile with the kimono she turned awkwardly with the lack of the second leg and slid into the bath, letting the water envelope her up to the neck. Goosebumps spread across her skin and she shivered slightly, though the cold water felt nice on her feverish skin. She reached over the edge of the baths and grabbed the wine skin that lay there. The girl still stood silently by the door, a slightly discomforted look on her face from the cold air. Nova took a swig of the wine and leaned her head back against the bath and held the wineskin in the girls direction, “Would you care for some? It'll warm you up from the inside. It is a little cold in here, is there a way to heat it do you know?” Nova felt silly for asking someone who she did not believe was real such a question, but perhaps her subconscious would find the answer to her own question. Wiggling the half-empty wineskin in the girls direction again Nova spoke again, her words started to slur very slightly from inebriation, “So tell me about yourself. You look a lot like him... Lord Osada. Like a mini-him. Same hair. Same expression too” She giggled as she spoke, the girl really did have the exact same menacing expression that Lord Osada did. Waiting for a response, Nova dipped her head under the water, auburn and teal waves of hair feathering out across the waters surface for a moment before she resurfaced and looked back at the girl. Silently, Haka observed Nova as she undressed and undid the wooden leg before stepping into the cold bath. Disliking the idea of a cold bath herself, she was nonetheless impressed with the resilience the human body showed against a temperature that would surely would have thrown any spider into hibernation, and drown it afterwards as their body would not react strong enough. She perceived the brief raise of Nova's arm hairs in response to the cold, only to see them disappear under water as she plunged in and allowed the water to reach her neck. Meanwhile, her mind mulled over the flood of words Nova had given just a brief moment ago. She had made a mechanic spider because she had seen a spider climb up walls? That sounded more like she wanted to be a spider rather than dominate them, a conclusion that felt strange nonetheless but not impossible to achieve. Perhaps, if this human was taught how to turn into a spider much like Haka could turn into a human, she would no longer need the puppet spider. But was this even possible? It would mean the human species would have to evolve beyond the limitations they suffered, something Haka didn't quite believe them to be capable of considering the construction of the puppet, much like the construction of their weapons, only proved how much they needed other tools to surpass their limited power. Oddly, Haka could not bring up as much dislike for Nova as she generally did for other humans. When she was offered the wine skin, Haka tilted her head ever so slightly and shifted her gaze from Nova to the item in question. She had seen the girl drink from it a few times, but that didn't make her less cautious of the liquid inside. What was it anyway? A human drink for sure, but which one? Hearing how the drink could warm her up from the inside, she inched closer, lured by the idea of not having to deal with this cold. She was about to reach out for the wine skin when the last of Nova's question changed her mind. Of course, there was a way to heat the bath as the servants had done so before. If she could figure it out, she wouldn't have to drink human liquids to stay warm, and as such decided to search for the system that heated the baths. Leaving the baths temporarily, Haka ultimately found the adjacent small furnace room which provided the warmth and started to poke around. Lacking any decent knowledge on how to operate such a furnace and making quite a ruckus in her search for the solution, a servant eventually appeared to see what was happening, upon which Haka simply pointed at the furnace with a "Make it warm". As the servant started to take care of the baths heating, Haka returned to Nova, hands rather dirty from the bits of coal and ash that lingered around. Upon returning, Nova wiggled the half-empty wine skin in front of her again, her offer seemingly still standing. Where the first time she had been able to run away in search for an alternative, she could not do so again, leaving her with the choice to try out the 'humane way' or simply refuse. Ultimately driven by her father's wish to experience humanity, the spider-nin took the wine skin with both dirty hands and took a good swig, not knowing just yet any moderation or impact the wine would have. Feeling the alcohol burn her throat ever so slightly, she coughed at its unusual strong sensation in comparison to her usual nourishment and returned the wine skin to Nova, who questioned her. Then, the girl disappeared under water, her hair turning into a blur as it seemed to disperse within and on the water's surface. Haka blinked a few times, finding it rather troublesome that her perception of the world around suddenly seemed to succumb to random little twists and sways. A byproduct of the strong liquid? It had to be. Feeling like standing was no longer a safe choice, she sat down and watched Nova resurface eventually. Right, her question needed an answer. Wait, no, she didn't ask a question. She had stated something about Lord Osada and how similar they were in looks and expression. "Sero Osada is my father. ", she revealed, providing the missing link to Nova's mystery, upon which the whole world suddenly almost barrel-rolled in front of her. In a reflex, she placed her hand on the floor next to her. Her body did feel warm now, and yet still cold. The nipping of the air was slowly being driven back by the incoming warmer air created by the servant's stoking, but even then the spider was not quite sure what she had to make of it. This human drink was nothing like her usual diet. Far not nutritious enough, not thick enough and too light. So light it refused to stay in her stomach, instead nesting itself in her head and blurring her otherwise sharp sight. With a light frown on her face, she asked,"What was that liquid?" Nova smiled and leaned back in the water as it started to bubble and warm up. She rolled her shoulders in the warm water and enjoyed as it washed away her aches. Moments after the water started to warm, the girl returned from the room slightly dirtier than she was before. Her hands we blackened with coal dust as she returned to the room and Nova held the wine out in her direction again. The girl seemed to have an internal conflict on the matter than Nova found silly, though since this was a bit of her imagination or delusion she wasn't sure what was normal or not, before coming and sitting on the edge of the tub stiffly. Nova ruffled the girls hair with one and and handed her the wine for a single sip. The girl took a swig and coughed immediately with a weird expression on her face. Nova took the wineskin back from her hands and drank some more. "Sero Osada is my father. ", she girl responded to Nova's question. Nova had nearly forgotten that she had asked anything at all after a fit of laughing at the girls face, and upon hearing that she was the daughter of Lord Osada she couldn't help but giggle more. Who was her mother? Who could have drawn enough interest from Lord Osada to compel him to procreate with her. “Laaaaady Osada? Princesssss Osada? Nova sing-songed at the girl, the concept Lord Sero Osada having a daughter caused another outbreak of giggles after. After wiping the tears from laughing from her eyes, Nova looked back to the girl to see a concerned expression on her face. She was bracing herself upright with an arm and her face twisted with slight displeasure, "What was that liquid?". “Fruit wine, not too strong and almost too sweet. Id give you no more than a sip though. Though i've maybe had a bit too much”, Nova slurred, her face blushed and her vision slightly blurred. She was certain she would be even more wobbly upon attempting to stand and decided that sitting in the now warm tub was the best choice. Nova reached up and ruffled the girls hair once more before settling back and talking to herself for a moment, “Too bad this is a weird dream. You are way less scary than what I was expecting. I was expecting.... I don't know actually. More of whatever it was Lord Osada made me fight? Made me dream that I fought? hm.... Well, what do you do for fun in these halls princess Osada?” Nova lightened the mood again with the question at the end, noticing that the drink was causing her to be more introspective than one ought to be about things made up in the mind. The ruffling of her hair was an odd sensation and Nova might just be lucky wolf spiders were not of the overly aggressive sort of arachnids or Haka might have strongly reacted to it in false assumptions she was in danger. A natural spider, the touch of affection was certainly not something she was familiar with, but Nova's hand felt slightly wet and warm, the weight on her head strangely comforting and all together completely alien and awkward. While Haka ran a hand through her hair to put it back in place after the ruffling, Nova seemed to monologue about how Haka was not as scary as she had seemed. An odd statement, as Haka didn't find herself scary and so didn't quite understand why someone else, especially humans, would do so. Likewise, to be named 'princess Osada' was much in line with the previous oddity of hanging labels onto names - Lord Osada was just Sero to her, so 'princess Osada' would simply be Haka. "Haka likes observing and hunting." Then, the spider-nin's hand slipped, making her fall over flat on the ground. She didn't feel quite well, the ceiling above her seemingly spinning like a record. Though pale by nature, she now turned completely white, beads of perspiration showing up, and her stomach strangely upset with the liquid it had been fed. Nova asked her if she was alright, but the words were slurped up by the spinning ceiling and never seemed to fully register. Feeling like stopping the ceiling from spinning, she reached out, seeing her arm in double, and suddenly remembering she would probably be better off if she'd simply take on her natural form. The words sounded louder than they had been spoken, pulling Haka back into reality for a brief moment. She realised Nova had approached her again, hand resting on her head. The spider wanted to say something, but could not quite remember the human words for her answer and eventually ended up muttering something in the spider's speech with an equally slurred voice. Not being able to handle the situation much longer, she changed, somewhat forced, somewhat natural, into her spider form. Her body broadening in some parts, white hair sprouting over her entire body to cover her, the human turned into a chalky white, misty grey wolf spider of 5 ft size. Even with four legs more than the human form, her inebriated state was not quite able to hold her ground as a few legs slid away, seemingly failing to hold grasp of their surroundings despite the spider's natural ability to hold on firmly. Eight black beady eyes looked upon the world with a strange scowl upon the spider's face and helped holding onto a more stable picture of the room. Having regained a modicum of stability despite her completely drunk mind, the wolf spider's eight cold eyes gazed at Nova apathetically as if the spider had registered her just now, and was now determining if she was a threat, prey or something that would pass by. Nova felt a pang of worry as she saw the girl topple over. Quickly as her inebriated self could she went over to the girl to check on her. Only a sip shouldn't effect anyone that badly, though there the girl lay. As Nova stare down on the girl she blink several times as something she couldn't fathom happened. In a slow process, the girls body altered before her. More eyes sprung to her face, as well as four more arms springing forth from her torso. Nova began to laugh, what a strange dream she was having. She must have had more to drink than she thought. She giggled somewhat crazily as the short girl was no longer there, but a five foot wide spider covered in grey-brown hairs. It took a step as it righted itself, either legs tripping over each other drunkenly. Nova would burst out laughing at the absurdity of her evening. Maybe she didn't even meet Lord Osada or reach the mansion, maybe she had overslept and experienced a bizarrely vivid dream. She pinched her forearm and felt a prick of pain, though she didn't know if that even worked. The eight eyes shined up at her in the dim lighting, Nova now giggling near manically. She leaned forward unsteadily and rubbed one of the spider's leg, petting it as if it was a pet she was fond of. She felt the bristly hairs against her skin, but she pet in such a way it did not irritate them. The spider was nearly the size of Kurogokegamu yet was not made of such materials, all visibly traits indicated a true arachnid of enormous size here in front of her yet she would not believe it. The thought that the young white haired girl whom Nova had followed to the room and baths turned to a spider in front of her, after a single sip of wine and no more? Unable to stop the laughter, with tears streaming down her cheeks from it she shook her head, giving the spider a gentle pat on its head before leaning over precariously to pick up her clothes with the towel still wrapped around her. Hair dripping wetly down her back, Nova would turn and babble between laughing fits, “Princess Spider.. Lady spider... I wonder if she makes doilies out of her webs”. the last one really sent Nova giggling out the door and into the hallway and leaving the girl-turned-spider in the warm baths alone. In the hallway she dropped her leggings and halfway further she dropped her tank. At the second door Nova struggled with the door handle, wiggling it around for a moment before finally swinging the door open. Walking a few feet inside she looked around, seeing both a lack of Kurogokegamu in the room as well as the presence of another persons belongings. Turning on her heel she walked back out that door and closed it behind her, embarrassed about the mistake at first but then realizing there was no one here to see it. Shaking her head in a joking self-deprivation at her silly mistake she walked to the next room. The door swinging open she was glad to see Kurogokegamu in the corner as she had left him. Walking over to her clothes and sliding on leggings and a loose shirt she grabbed the blanket and pillow from the bed and walked over to Kurogokegamu. Slowly and clumsily climbing up the puppets side, Nova slid into the cushioned hull and closed the top. Comfortable inside with pure darkness around her, she drifted off into a deep sleep. Dreaming of foes who had the consistency of water and girls who would shed their skin and take the form of giant spiders. It was quite an awkward predicament for a spider, having eight legs and still not able to hold stable. Her legs fell like spaghetti, completely numbed by the alcohol and her world had the oddest twist she ever experienced. Whatever this fruit wine was, it was a terrible poison despite its admittedly good taste. As Nova almost died of laughter, only to stumble her way towards her home, Haka decided she'd avoid moving around too much and stay here for the night. Climbing the walls in a slow-mo fashion, she eventually nested herself in the corner of the ceiling and the walls, remained there unmoving until the heat dissipated and the creeping cold lulled her into a hibernating state.